My Lead System PRO claims that they are the only place you can get a "PhD" in online marketing, lead generation, branding and business success. So, is My Lead System Pro a scam? Clearly, this statement above is just a marketing strategy. I've seen a lot of outdated My Lead System PRO reviews around. All the pricing and many tools have been upgraded recently. So I just want to write this updated review on MLSP to better help new people who are searching for this program like you! Summary: My Lead System Pro has a set of powerful training and tools to help you get more leads and sales online. But for beginners, the cost is a bit too high and the training can be really overwhelming. MLSP is only for people who have an existing business. My Lead System PRO (MLSP) is formerly known as "MLM Lead System Pro". It started off as a service to help Network Marketers & Multi-Level Marketers generate more leads (potential customers) & sales online, instead of approaching their friends and family members. 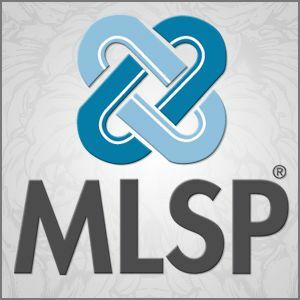 "MLSP is a MLM company helping network marketers to grow their MLM business." Currently, it has evolved into a very comprehensive service which can help not just network marketers, but also affiliate marketers, small business owners or any people working from home, to generate leads for their businesses. I said MLSP is a service because they offer a wide range of help. They have training, tools and support to help you build your list and follow-up with your list. They also have a huge community to help everyone succeed. My Lead System PRO focus on a marketing method called "Attraction Marketing", which simply means ATTRACTING customers to you by building your brand and offering values, instead of going out there pitch to a group of "cold traffic" (people who are not interested) and hopefully they will join you. Attraction Marketing is a lot harder to master and it takes time. It's not like some system you can just follow step-by-step and expect a result. However, attraction marketing can be very effective in the long run if done right. That's why MLSP has lots of training on teaching people about using attraction marketing to grow their leads and sales online. At the same time, the tools provided by MLSP are also based on the concept of attraction marketing to help you on the technical aspects. How to Make Money with MLSP? MLSP's main goal is to help people bring their business to the next level by acquiring more leads and sales passively. So if you're already a network marketer, affiliate marketer or a home business owner, you can expect a growth in your business when you follow MLSP's training and leverage its tools. But at the same time, My Lead System Pro has put a huge focus on its own "affiliate program". I use inverted commas for MLSP's "affiliate program" because it is not really an affiliate program. They called it their affiliate program but a lot of people have confirmed that it is actually their own MLM business. They have their own compensation plan and you will have your sponsors (upline) and downlines. Basically, you can make money by referring people to join MLSP. Every business needs leads to increase their customers and sales. So it's not just limited to these groups of people I've just mentioned. You can benefit from MLSP as long as you have a business and you need more customers. Having said that, it's obvious that MLSP is NOT for people who don't have any existing business. Although you can make use of MLSP's referral program to make money, it's hard for you to get any results if you're new to online marketing. MLSP has over 46 training courses in their platform. The good thing about their training is that they've categorized them into beginner, intermediate and advanced levels. As you can see, the first lesson for beginners is the foundation in attraction marketing. There are also lessons to help people find their target market as well as lessons on mindset. 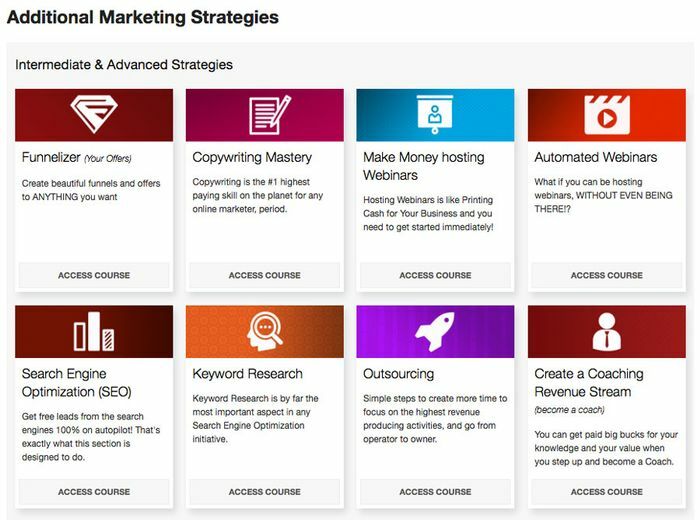 In advanced training, you'll learn about things like setting up your automated webinars, outsourcing and becoming a coach. Basically, MLSP has a very thorough and comprehensive set of training which is really helpful for anyone in business. They are in bite-sized video and text formats so they are pretty easy to consume. The only issue is that some of the videos are more than one hour long but only 20 minutes have useful content. One last thing, MLSP has a weekly live training since 2008 teaching a wide range of useful information and strategies for your business. I really love this part because I can see the founders of MLSP are constantly looking for ways to improve the community and add more value to all the members. 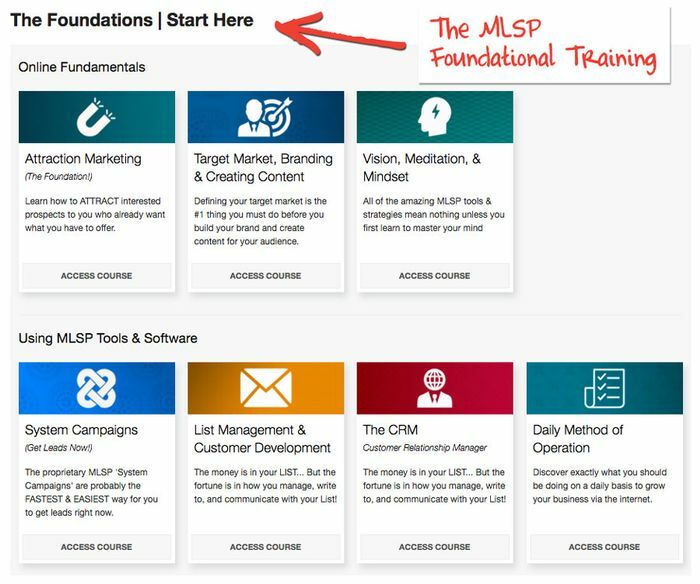 Not just training, MLSP has some really awesome tools to help you grow, engage and follow-up with your leads as well. Funnelizer is a tool that can help you build your own custom opt-in page, sales page and funnels. These are all important components of a successful lead generation campaign. This tool is very similar to ClickFunnels and Inbox Blueprint's LaunchPad. MLSP SITES is a blogging platform which allows you to create your own blog and publish contents. This is another medium to market your business and it's called content marketing or Search Engine Optimization. MLSP SITES have access to their premium hosting, security and plugins. However, the downside is that this is not available in the basic membership which I'm explain later. MLSP CRM is another powerful tool because it allows you to easily follow-up with your subscribers, schedule appointments, send Emails, rate your prospect and track your potential customers. Basically, it has a lot of features to help you build relationship with your list and eventually monetize it! Every Monday to Friday, MLSP will host a Podcast every morning and leaders will share their valuable knowledge and experience as a way to boost members' motivation in the morning. This is also a very helpful source for members to learn and hone their skills. There are MLSP certified coaches to work with you 1 on 1 to help you create custom marketing plan. MLSP has a very huge community to support you along the way. They have their own private Facebook group as well. How Much Does MLSP Cost? Most existing My Lead System Pro reviews have outdated information about the cost of MLSP because MLSP has changed their pricing options. So let me give you the updated one. Currently, they have 3 membership levels - basic, professional and premium. 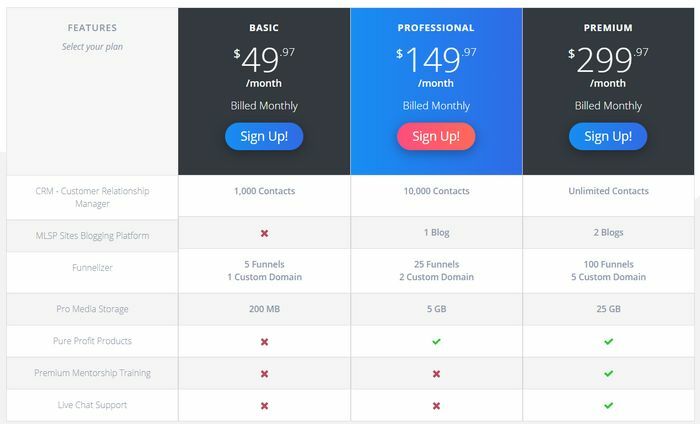 The image above shows the pricing that is billed monthly. 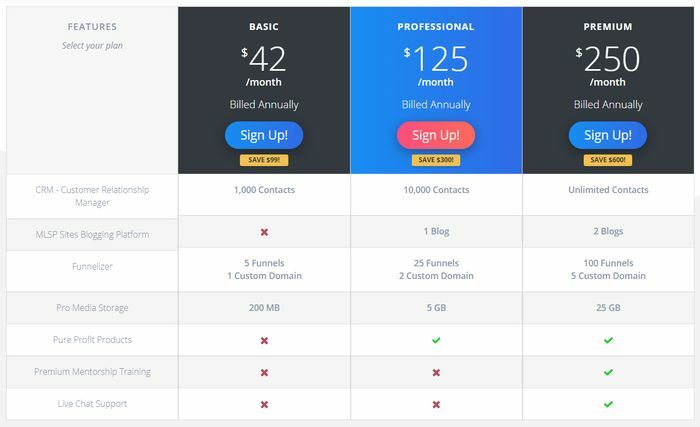 ​And this image shows the pricing that is billed annually. Take note that the basic membership is very limited because you don't have access to MLSP Sites blogging platform, Pure Profit Products, Premium Mentorship Training and Live Chat Support. Whilst for professional membership, you don't have access to Premium Mentorship Training and Live Chat Support. Only if you pay the Premium membership which can cost up to $300 per month to gain access to everything. This still doesn't include other upsell training within the platform. There's no Free trial for MLSP but they call it a "30-Day Risk-free test-drive" because you're covered with a 30-Day Money-Back Guarantee. How much you need to pay upfront will depend on the membership package you choose. Like I've explained earlier, MLSP has a really comprehensive training with lots of useful information in many different areas. Not only that, they are categorized into beginners, intermediate and advance for people with different levels of experience. There's also a special training for network marketers. Not only that, their weekly live webinars are very useful too! My Leas System Pro has one of the best support system I've ever seen. Not only do they have a community which many other platforms also have, but they also have 1-on-1 coaching and Live Chat support available. You'll never get lost in MLSP if you make use of all these support systems. MLSP was founded in 2008 and the fact that it has survived for more than a decade now shows that it is a good system. In fact, I can really see how much effort the founders are putting in the make this community better. My Lead System Pro is the market leader in Attraction Marketing. They are one of the pioneers in this area and had since built a really great community and system to help more people. If you look around the market, there are very few companies that actually focus on the concept of attraction marketing. But I can personally guarantee you that attraction marketing is very important in any business today and in the future. The cost of MLSP membership is definitely expensive. It can cost up to $300 per month which is definitely not affordable for most beginners. What I want to talk about here is that they purposely create 3 different levels of membership by blocking access to some of the features for lower end memberships. Although this is common in many companies today, this kind of pricing strategy clearly shows that their main purpose is to make money from you. The fact that they have a lot of training materials pose another problem and that is beginners will likely to be overwhelmed. This is a common problem for good companies that put a lot of focus in creating values. However, they need to organize and structure them into easy-to-follow and step-by-step guide. Just like the example I've given earlier on, there are video training that lasts for more than 1 or 1.5 hours but only 20 minutes are useful. The beginners I'm referring to here are those who don't have an existing business of your own. You can have a 'brick-and-mortar' business or you can be running your own website as a blogger. It doesn't matter. As long as you have your own business, you can benefit from MLSP. Unfortunately, for those without a business, it'll be very hard for you to just leverage their "affiliate program" to make money. As of the membership price, it is also a bit too expensive for people who have not made any money online. Haven't Made Your First $1 Online? Studies have shown that more than 70% of the people who want to make money online have not made their first dollar yet. So you're not alone! Wanna Check Out My Top Recommended Training? My Lead System Pro has been trying very hard to add more value. But at the same time, I can see that they also want to make a lot more money. They've created a lot of extra learning resources & training on various different topic. Being a MLSP member, you'll encounter quite a lot of upsells regarding these resources. Check out their product lists here. MLSP didn't draw a clear line between MLM and affiliate marketing. They claim themselves to be an affiliate marketing business yet they are operating more like a MLM system. Even some very successful members of MLSP like Ray Higdon has confirmed that it is a MLM. 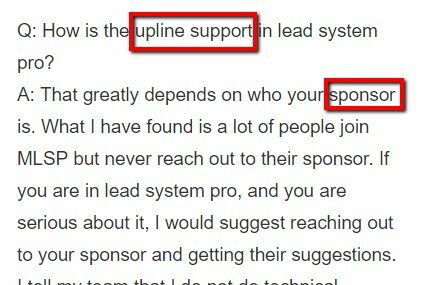 When uplines/sponsors are involved in the system, it's clear that this is a MLM. Nope, My Lead System Pro is definitely not a scam! They are a very huge and engaging community where people can gain a lot of values from. Kudos to Brian, Todd and Norbert! It's impossible for MLSP to survive for more than a decade if they're not constantly improving the community and the platform. The downside is that the price is not cheap but it is justifiable due to the value it provides. 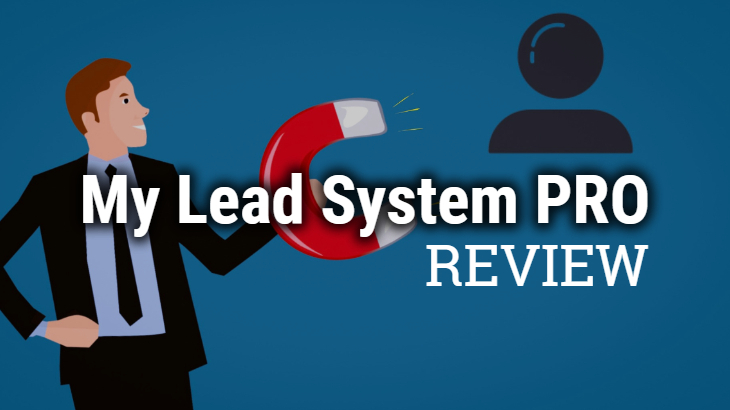 If you're a home business owner, My Lead System Pro is a good service to help you bring your business to the next level. But if you don't have any existing business, MLSP is not that helpful to you at the moment. It appears Nigerians can’t signup for WA program. What is happening and how can you be of help? Yea, unfortunately that’s the case. Do you know how to use VPN? Thanks! I’ve been able to signup and received your welcome message on my dashboard. I hope to get your mentorship going forward. Wow, that’s awesome man! Congrats! For sure, I’m happy to be your mentor along the way. How did you managed to sign up? VPN? Thank you so much for the article, Jerry! It was really helpful to me. I’m currently researching the available options, like Wealthy Affiliate, MLSP, Elite Blog Academy etc. I’ve been a member of Wealthy Affiliate and MLSP. I was a MLSP member for about 3 months a few years ago. It was certainly expensive. They upsell you on training products about every week or month. It definitely isn’t for the beginner who is short on cash. I appreciate Wealthy Affiliate (and have actually made money while doing their training, unlike MLSP where I just ended up buying the next great course). Thanks a lot for sharing with us your experience. Personally, I hate programs with lots of upsells. So I’m really glad you’re having some good progress and making money from Wealthy Affiliate. I wish you all the best! Hey Jerry, I’m rather a beginner when it comes down to online marketing therefore ‘My Lead System Pro’ is obviously not for me. I’m quite staggered with the $300 per month fee they charge for the full service. It’s way out of my league but if they are the market leader in attraction marketing, maybe it’s worth the price for the experienced online marketer. Another issue I have regarding these types of MLM schemes regards to their upsells. MLSP have plenty of these meanwhile they are very expensive too. Yup I agree the price and upsells are not beginner-friendly and it’s definitely not for everyone. I think it’s more for those who already have a profitable business running and they can leverage services like this to scale up their business. The good part about the system is that it is for the more experienced marketer and you can take some good away from this. The bad is that it is not good for beginners and the price you mention is really expensive. But I guess each person in this line of work should know if this program is for them. Yup, this program is definitely not for everyone but I believe it will help those who need it! This is such an useful review. It is very well written and I am sure this will help all the readers. Thank you so much for the great article. I will share it with others and look forward to more useful reads from you. Hi Jerry, this is a very well researched review. One of the best I’ve seen in a long time. You are thorough and you outline in detail everything that can be expected from this company. I also believe that your ability to objectively assess these marketing opportunities positions you well. Much respect to you.